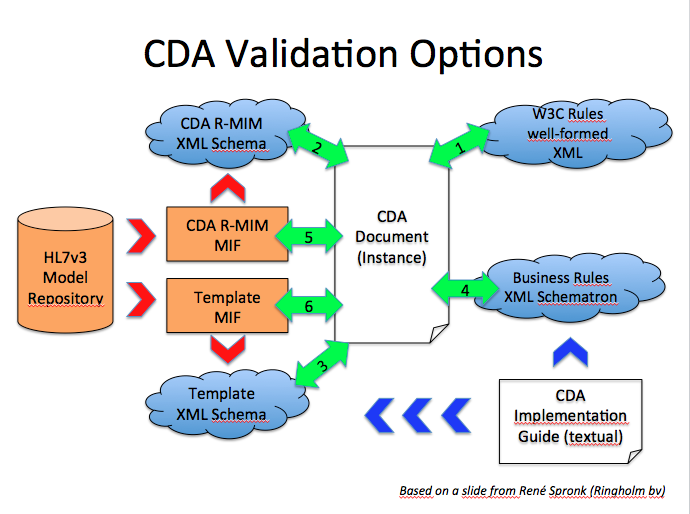 The following graph based on a slide from René Spronk (Ringholm bv), summarizes the CDA Validation options. If we have a template specific schema, then we use that one to check the validity of the CDA document. From the CDA implementation guide (IHE technical framework, epSOS specs,...) some business rules are expressed into a schematron document that we use to validate the CDA document. René Spronk wrote an excellent white paper on MIF, we recommend its reading in order to better understand the concepts. The definition extracted from that white paper states : "The Model Interchange Format (MIF) is a set of XML formats used to support the storage and exchange of HL7 version 3 artefacts as part of the HL7 Development Framework. It is the pre-publication format of HL7 v3 artefacts used by tooling. It is also the formal definition of the HL7 metamodel. The MIF can be transformed into derived forms such as UML/XMI or OWL." The jar is integrated to the Schematron Validation Tool, the MIF used are the one from the CDA R2. 356 days since EU 2018.